HideIPVPN Review 2018 – Does HideIPVPN Unblock Netflix? Mandee Rose	● Posted on February 28, 2018 February 21, 2019 ● Leave a comment on HideIPVPN Review 2018 – Does HideIPVPN Unblock Netflix? HideIPVPN has a cool Ninja fighter theme for its site and app. This competent VPN service has a lot of up sides but also a few flaws, so please read our review to inform your decision on taking out a subscription with this VPN service. HideIPVPN has a dazzling array of plans. Each of these plans can be taken on a monthly, three months, or one year subscription. The rate users pay per month gets cheaper with longer subscription periods. Account sharing is not allowed. 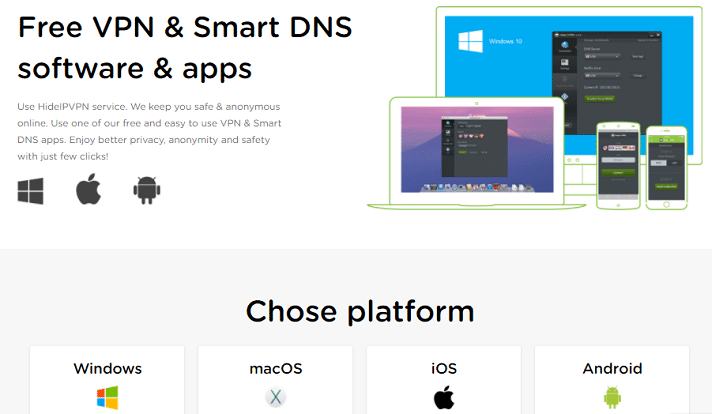 You can connect three different devices to the VPN service concurrently and there is no limit to the number of devices you can connect to the smart DNS service. However, those smart DNS connections all have to be from the same IP address, which means through the same home router. You cannot connect to the same VPN server more than once at a time, so if you want to connect three devices at the same time, you need to connect each to a different server. 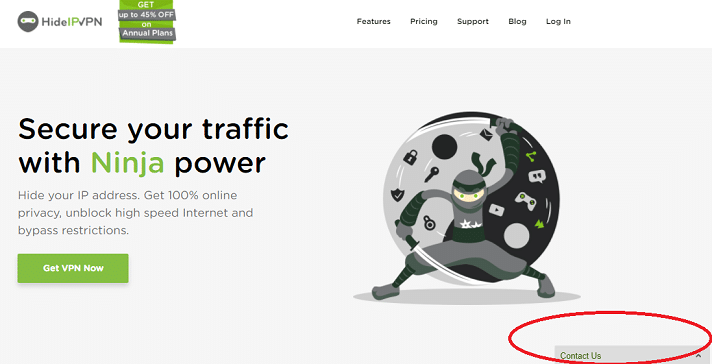 You get the use of the smart DNS service for free when you sign up for the Ninja Power plan. Each of the three country plans also includes access to smart DNS but only providing access to servers in the named country of the plan. You can pay for a subscription with a credit card, through PayPal, or with Bitcoin. The company has a 30-day refund offer. However, that only applies to users of Windows, Macs, and Linux computers — there is no guarantee for installations on mobile devices, routers, or home entertainment appliances. There are some other conditions on the refund policy, so it would be better to take out the one-day free trial and make sure you are happy with the service before you pay for a subscription because you might not get your money back. What Features Does HideIPVPN Have? At VPNAnalysis.com, we are particularly interested in the OpenVPN implementations offered by VPN services. 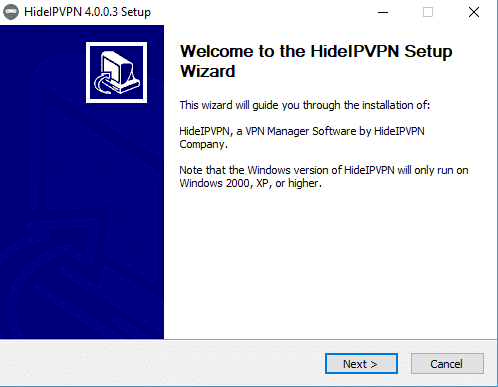 HideIPVPN has OpenVPN, but also IKEv2, L2TP, SSTP, SoftEther, and PPTP. All of these methodologies can be accessed through the HideIPVPN app, which is a lot of useful options. However, this section of the review will focus on the OpenVPN service of HideIPVPN (our recommended protocol). OpenVPN is implemented using AES encryption. This is a fantastic encryption cipher that is used by the US government. The security of a cipher lies in the length of its key. HideIPVPN uses a 256-bit key for its AES encryption. This is the top of the line and puts this service among the best VPNs that you could choose. A big problem with AES is that both ends of the connection need to have the same key to encrypt and decrypt data, so the transmission of the key needs to be protected by another encryption system. HideIPVPN, like most OpenVPN services, uses RSA encryption to protect data encryption key distribution. This is a public key cipher where the encryption key and the decryption key are different. RSA needs a much longer key. The best VPNs use a 4096-bit key. HideIPVPN uses this length of RSA key for its SoftEther implementation. It uses a 2048-bit key for OpenVPN. The 2048-bit key is perfectly safe, for now. It would be nice to see HideIPVPN ramp up its OpenVPN RSA encryption to have a 4096-bit key. The company that owns HideIPVPN likes to give the impression that it is based in the USA. The same company name is registered in the USA and in Moldova. Moldova is a much better location, legally, for a VPN, but the owners of the company seem to have decided that prejudice would count against them. In this review, we encourage Moldova to be realistic about their real location, and also that they should be proud about who they are and where they are. Moldova is a much better place for a VPN than the USA and we challenge the company to pull out of their alignment with the USA: a location that isn’t good for privacy. Moldova is outside of the EU and also outside of the Five Eyes security alliance, so it offers a lot more freedom than many of the countries that are home to VPN services. This is a very small network and it shows that the company has decided to focus on a restricted market. Despite this, they are in some pretty useful locations. 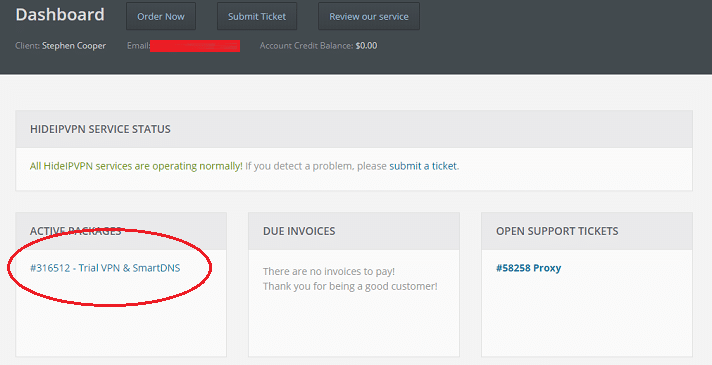 You can get a refund if you cancel the service within thirty days. However, the fine print of conditions on that refund is pretty extensive, so it is better to make sure that the system works on your device before you commit any money. HideIPVPN offers a one-day free trial. this gives you a good opportunity to test the service, and also permits you to avoid the complicated refund process. 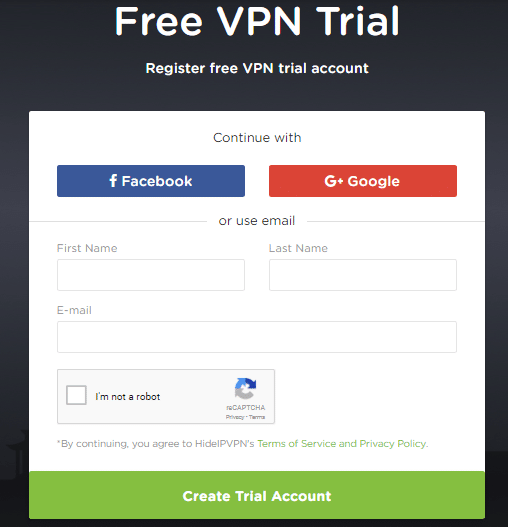 Scroll down on the Home page of the HideIPVPN website to get to the free trial button. The account creation screen is very simple. You do need to enter a real email address in order to get the trial. The system will send you a verification email and your free account will only work once you click on a link in the email to activate it. The Pricing page should be your first port of call when you want to subscribe to the service. Select a subscription period and then click on the “Order Now” button beneath the plan of your choice to get through to the Shopping Cart of the service. After setting up an account, you need to pick a payment type. Make sure to check the box that declares you have read the Terms of Service. 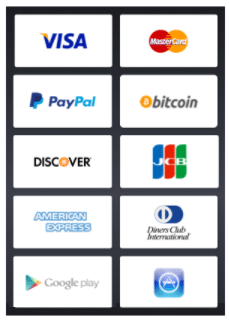 The following screens depend on which payment method you choose. Once your payment clears, you will receive confirmation by email, so it is important that you use a valid email that you have access to. 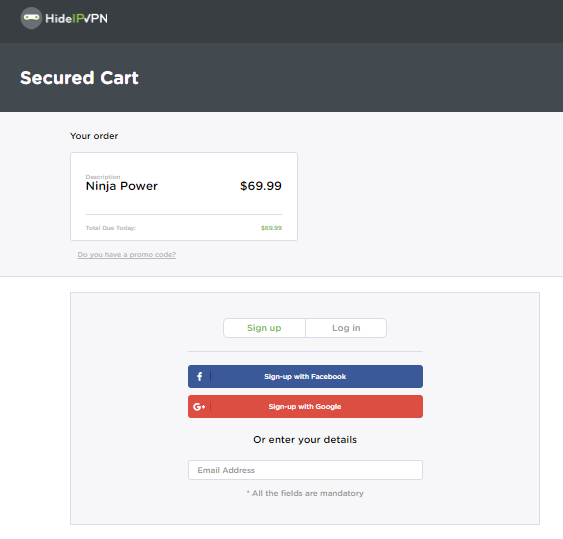 Once you have signed up for an account, you get access to the members area of the HideIPVPN service. This is where you can check on your account. Click on the description of your current plan. Under the VPN tab in the next screen, you can see the username and password that you need for the VPN app. The credentials that you were sent by email only work in the Client Area of the website. 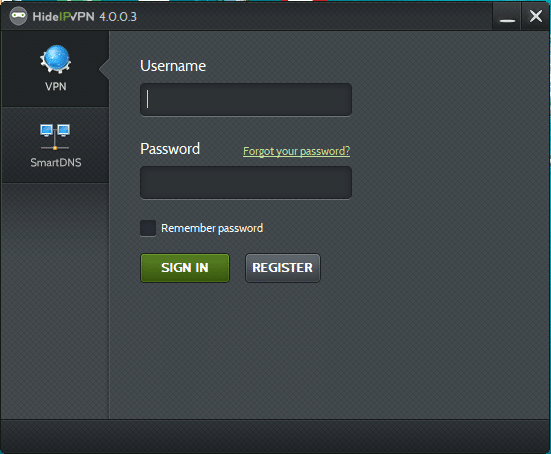 The generated username and password for the VPN are difficult to remember, so you should change them in this screen. 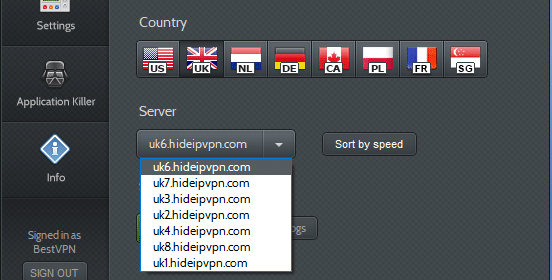 Click on the words “HideIPVPN software” to get to the download page of the site. Click on the symbol for your operating system to get the download to start. Once the download completes, click on the downloaded file to open the Install Wizard. You just need to click through the screens in the installer. The final page will tell you to reboot to finish the installation. You can either reboot immediately, or elect to restart your computer later. The VPN app won’t be available until you complete this step. When the installer program finishes its work you will notice a new shortcut on your Desktop. Clicking on this shortcut will open the app. 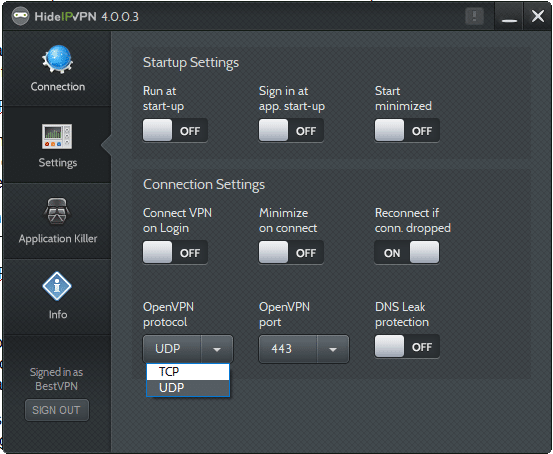 The initial screen gives you the option of getting into the VPN or the smart DNS service (read more on this later). You have to enter your username and password for the VPN. These are the credentials that you entered when you subscribed. The app’s main screen presents lots of options through buttons and drop-down lists. There are more settings on back pages of the app that you also need to take a look at before you turn the VPN on. The first row of buttons will change the VPN technology used for your connection. We at VPNAnalysis.com recommend OpenVPN. The second button row gives you the ability to select a country to narrow down the list of VPN servers that you can select from the list below. That list can be re-ordered according to a live speed test. This check will put the servers in order with the fastest connection from your location first. It is a shame that these servers are labeled with their ids rather than their locations. You can see the actual city of each server on the server page of the HideIPVPN website, which is reproduced above in the Logs and Locations section of this review. Click on the Settings item in the left hand menu before you make your first connection, because there are a few more options to check out first. For your first try of the VPN connection, just make sure that the OpenVPN protocol is set to UDP. This is the User Datagram Protocol. At the creation of the Internet Protocol suite, the Transmission Control Protocol (TCP) dominated the transport methodology of all internet connections. However, since Broadband made interactive apps, such as IP telephony possible, UDP has become the preferred protocol: because it is faster. UDP is also perfect for streaming. Once you have set UDP as your transport protocol, go back to the main screen and press the Connect button. The status message of the app will show that you are connected and the Connect button will be replaced by a Disconnect button. When you click on the “X” in the top right corner of the app, it will close the app window. However, the program will continue running in Minimized mode. To access the program again, click on the masked Ninja icon in your system tray. Click once on the icon to reopen the app, or right click on it to use the VPN in Minimized mode. You get an extra service when you sign up for the HideIPVPN plan, which is a smart DNS. 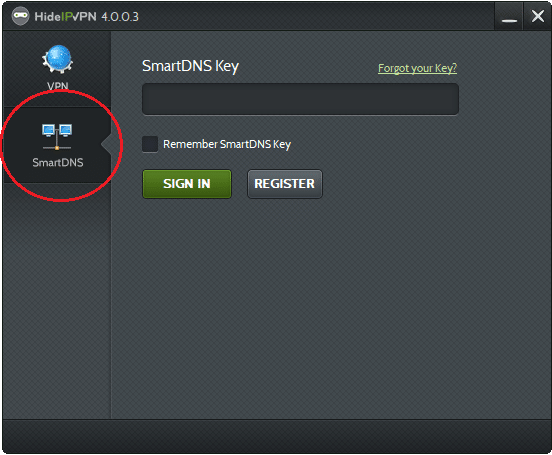 If you opt for the Ninja Power package, you get the full smart DNS package thrown in for free. If you go for the USA, the UK, or Poland VPN package, you get the smart DNS limited to the country of your service plan. VPNAnlaysis.com does not publicize smart DNS systems, but as this utility comes as a free extra with your VPN plan, we just had to take a look at it. Using the smart DNS service is just as easy as using the VPN. In fact, it is built into the VPN app. 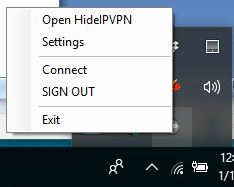 If you are already using the VPN, disconnect and click on the “Sign Out” button at the bottom of the left-hand menu. If you have just clicked on the app’s shortcut, don’t sign into the VPN. Instead, click on the SmartDNS button. 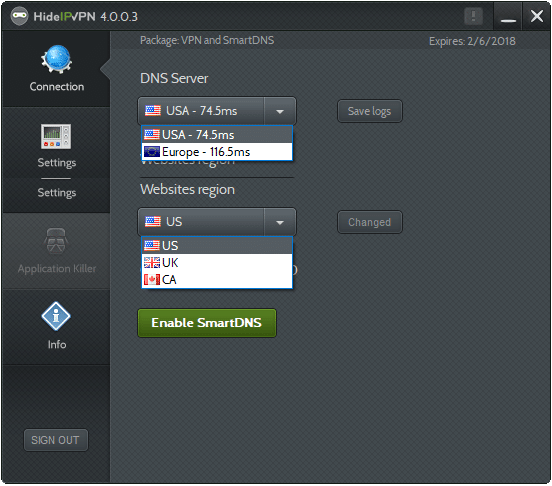 To get the Smart DNS key, you need to go back to the HideIPVPN website. Enter the Client Area and click on the name of your active package in the Dashboard screen. You will never remember the whole key. Fortunately, you don’t have to. Click inside the key field and the press Control and “C” at the same time. Switch back to the app and click inside the key field there. Press Control and “V” at the same time to copy in the key value. Press the Sign In button to get into the smart DNS app. The first field in the app gives you the starting point of your connections. Don’t worry about where you want to be, focus on where you are. The options are limited to Europe and North America, which tells you that this app doesn’t really cater to people in other continents. The second field sets where you will appear to be. Again, there are not many options here, just the USA, Canada, and the UK. Once you have selected the settings for the connection, just click on the “Enable SmartDNS” button to get the system working. The Support item on the top menu of the HideIPVPN website leads to the FAQ page. Those four categories you see at the top of the page are buttons that lead through to installation guides. 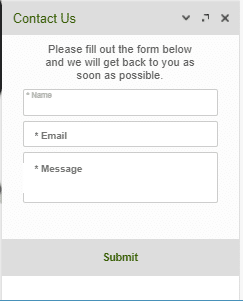 Scroll down to get to a small contact form. If you scroll down in any page of the website, you will reach a footer section. This contains a link through to another contact form. This form is a lot bigger than the one in the FAQ page. 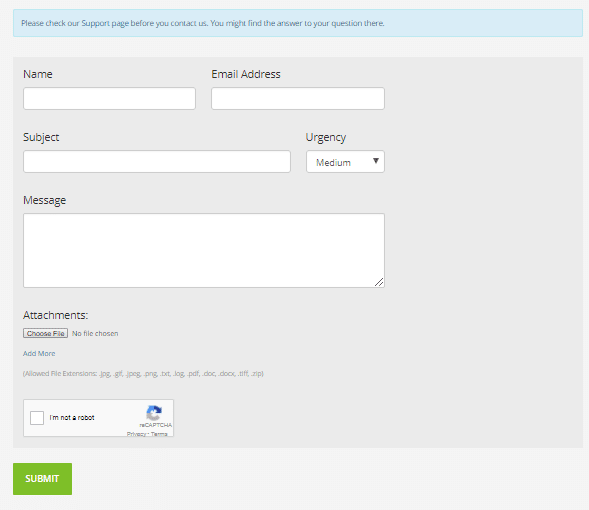 Once you subscribe to the service, you get access to a different support ticket contact form. You can check on the status of open support tickets as well. 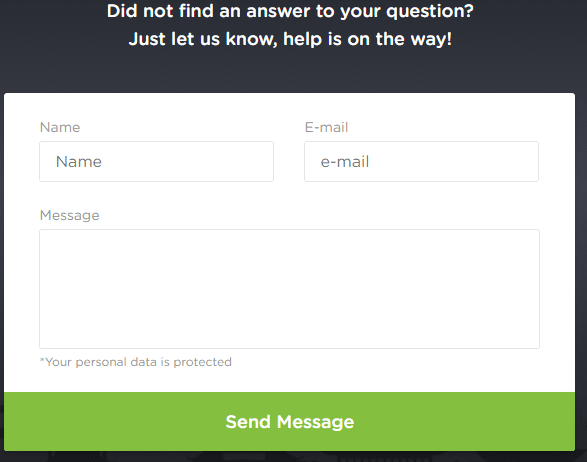 HideIPVPN’s website has a live chat system for contacting the support desk. This is available in the bottom right of most of the pages on the site. The facility has three states. When no one is on the help disk, you will see a “Contact Us” message. Clicking on this tab opens a message window. The reply to your query will be sent to the email address that you enter in the chat window. If you access the site when the live chat is manned, you will see a different label on the live chat tab. It reads “Live Chat.” To start a conversation, you need to fill in your name and email address. The third state occurs when the help desk is manned and not occupied. The chat window will pop up and you will be asked whether you need help. HideIPVPN has invested heavily in creating a very comprehensive support system. They made only one error: employee training. The staff on the help desk know little more about the service than you do if you have read through the information on the site. These tests were performed from a location in the Caribbean using OpenVPN with the transport methodology set to UDP. The test site, speedtest.net provided the test servers. The closest server to the test site was in Santo Domingo in the Dominican Republic. So, a baseline test went out to that server without a VPN active on the connection. This showed the quality of the underlying internet service. The first tests checked the influence of the HideIPVPN servers on connections to a test target in Miami. So, first, here are the download and upload speeds on a connection to that test server without a VPN. The app’s speed test revealed that the company’s server in Oklahoma City had the best connection speeds from my location, so I selected that server and tried the speed test again to Miami with the VPN turned on. The VPN performed very well. The small variations in performance of the connection with and without the VPN active can be put down to variations in the underlying internet service. I tried tests that examined the influence of the VPN service on speeds encountered on transatlantic connections. Without a VPN working, the speeds recorded on a connection to the O2 server in Slough, UK are shown below. The HideIPVPN server in the UK, which was in Maidenhead, actually made the connection to the test server a little faster in terms of download speeds. However, again, the differences in speed between the unprotected connection and the VPN-mediated line are within a performance margin that could be attributed to variations in the underlying internet service where I am. The speed test conclusion is that the extra protection service of the HideIPVPN service did not slow down connections significantly. Can I Unblock US TV Shows with HideIPVPN? HideIPVPN offers three methods of getting into overseas video streaming services. You might be looking for a VPN solely so you can watch TV from back home. You can try a proxy service, a smart DNS, or a VPN. HideIPVPN offers all three systems. So let’s look at how each of these performed for access to USA and UK video streaming services from the Dominican Republic in the Caribbean. In each case, I connected to servers for US access and tried Netflix USA, ABC, NBC, and CBS. The proxy service could not get past the detection systems of Netflix USA or the ABC website, but I could watch videos at NBC.com and CBS.com. Switching to the UK, the proxy system did not get past detection at Netflix UK and it also couldn’t get me access to videos in the BBC iPlayer. However, it did enable me to watch videos at the sites of ITV and Channel 4. The smart DNS system of HideIPVPN had no influence at all on Netflix, so when I set the system to make me appear to be in the USA, Netflix gave me the video library for the Dominican Republic. When I set the smart DNS to UK, I still got the Netflix service for the country that I was really in — the Dominican Republic. So, the smart DNS made no difference at all. Setting the smart DNS to the USA got me access to videos at the websites of ABC, NBC, and CBS. Setting it to the UK got me videos from the BBC, ITV, and Channel 4. So, the smart DNS worked better than the proxy. The VPN didn’t fool the proxy detection system of Netflix UK or Netflix USA, so I couldn’t get access to videos in either country. The UK VPN server that I tried got me into the BBC, ITV and Channel 4 video libraries. When I switch to a USA VPN server, I was able to watch videos from NBC and CBS, but not from the ABC website. Overall, the smart DNS system worked better than the VPN and the proxy servers for access to regionally-restricted video servers. However, even the smart DNS couldn’t give me everything that I wanted. Should I Subscribe to HideIPVPN? 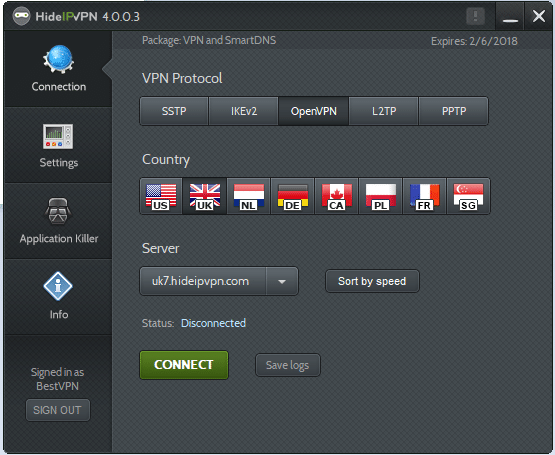 HideIPVPN is a good, solid VPN service. The company’s location in Moldova is a major advantage for P2P downloaders and the service’s BitTorrent package is well worth investing in for those who like to download a lot. It is a shame that none of the company’s channels could get into Netflix and it is a surprise that the VPN could not get me access to videos at ABC.com.